Sales enablement is intended to help raise performance, but a lot of efforts have backfired due to departmental silos. And now there’s growing gap between what salespeople need and what they’re getting to improve performance. For example, Corporate Visions recently surveyed 500 B2B marketers and sales professionals that 20% of organization content creators “just do what they think is best” with no overarching structure at all. And just 27% of organizations are content that focuses squarely on customers and rather than their own story. And all the tools and technologies meant to help boost sales productivity are now are slowing things down. Salespeople are getting overwhelmed and slowed down with increased complexity just like the customers they’re selling too. 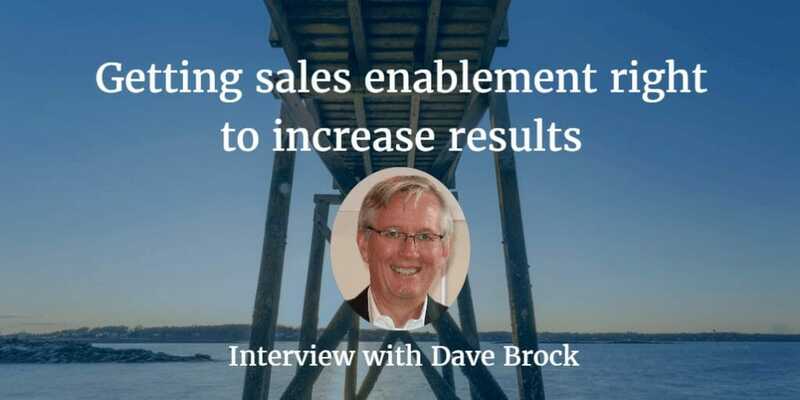 That’s why I interviewed Dave Brock (@davidabrock), author of the Sales Manager Survival Guide, also CEO of Partners in EXCELLENCE. Dave’s brilliance is his focus on practical simplification. And I’m excited to bring his thinking on sales enablement and what can be done to raise sales team performance. Dave: Brian, thanks so much. I really appreciate the chance to continue the conversation we started in Washington, and appreciate you inviting me to this. By background, I actually started out as a physicist in my career, and ended up going to the dark side of selling, and sold mainframe computers for IBM a number of years. Went up the food chain to more senior management roles, then left to become EVP of sales for a technology company as part of a turnaround, later held VP of Sales or CEO roles in several technology companies. And now run the consulting company – we help our clients actually solve some of the most challenging problems in sales and marketing, and dealing with the new buyers that there are. We have a highly collaborative approach in helping really outstanding people, solve really, really difficult problems. What is the biggest trend you see affecting your work and sellers today? Well, clearly, it’s the convergence of some things that we see in the marketplace. It’s the new buyer. Everybody’s changing the way they buy, and learning how we engage these new buyers, both through marketing, sales, and customer experience is critical. At the same time, we see tremendous transformations in business and business models, whether it’s the digital transformation that virtually every company is undertaking, or just older business models being displaced with new business models. We have some of the classics of Airbnb, turning the hotel and lodging market upside down or Uber turning the taxi and limo business upside down. We see that the new business models occurring are driving real stress on customers. And then the final thing is just overwhelming complexity, just between the rate of change, the amount of information we’re deluged with every day. Most of the people I’m meeting are really struggling with at least one of those three things. I see it impacting virtually everybody. Brian: I can relate to those challenges. I think just in talking about complexity for sellers and marketers, I was having a conversation with someone earlier and it’s just an overwhelming number of tools an average salesperson uses, or a marketer uses. It also creates challenges around collaboration, that internal collaboration. How do you get internal collaboration to improve sales performance? Dave: The easy answer is to break down the silos and start talking to each other. It’s easier said than done. The thing that we see is a lot of the issues we face, regarding internal complexity and internal collaboration, is just people being well-intended doing their jobs, but somehow their jobs aren’t aligned with each other, or there are things about their jobs that cause them to conflict with other people. Simple things like aligning roles and responsibilities, aligning metrics, some classic value stream types of analysis. I just had a conversation earlier today with a marketing executive and his top management team. We were talking about what’s the value proposition they create for sales, and sales is the downstream customer of theirs. I think, again, we have to rethink our working relationship, rethink the classic business process re-engineering of our workflows, our roles, and responsibilities. And really get some alignment in metrics, so that we realize we’re all on the same team, with the same end goal. Brian: That’s helpful. And something that’s really come to age recently is sales enablement. What’s the role of sales enablement to help achieve this? I think I’m on the wrong side of some debates on this. I look at sales enablement as more a set of processes in a set of activities than a separate function within the organization. If you look at what sales enablement processes are supposed to do, they’re meant to be able to help maximize the salesperson’s ability to perform. And so, you look at that and say they are a whole collection of things that we can do to do that. The first is the frontline sales manager and their role in coaching and developing everybody on their team to perform at maximum capability. But then these frontline sales managers need a lot of support in a lot of areas, whether it’s tools and technology, whether it’s new programs, whether it’s people selection and performance management, whether it’s training, whether it’s content and so on. So, you start looking at seeing all these things contribute to enabling the salesperson to perform at the highest level as possible. Now, who does that stuff? It could be all over the place. It could be marketing that’s doing some of this stuff. It could be HR that’s working on a lot of the talent management types of things. It could be sales operations, or it could be people in the sales function. So, I think the discussion around sales enablement is more powerful when we look at: what are the things that we need to do, and then, look at who in the organization can do those most effectively and most efficiently. Brian: I like how you talk about it because I often think when I speak of enablement, I often am looking at marketing and sales. But, as you’re talking, it’s bringing in the finance team, the human resources team, so it’s a collective effort, not just one single group or department. That’s the whole point you were saying earlier, about bringing down the silos. Do I understand that correctly? Exactly. I got engaged in debate not long ago about how sales enablement earns a spot at the CEO’s table. To me, that was one of the most ridiculous discussions I’ve ever seen. We now have sales enablement executives that not only want to have a spot at the Chief Sales Officer’s table but now they believe they should have a place at the CEO’s table. The CEO’s table’s getting pretty crowded. I think it goes away from the point of what we’re trying to do. And, I believe that it actually starts building more barriers to collaboration and working. We’re building to the degree that we are creating another silo and another set of functions competing for attention and corporate resources. Again, I tend to like to look at these as more processes and workflows, and what are the things that need to be done. And then we look at who can do those most effectively. And if it a sales enablement organization, well that’s really powerful, but we shouldn’t overlook the other parts of the organization. Brian: We spent time talking about sales enablement. Marketing does have a significant role in helping raise the level of performance for the sales team. As you and I were in D.C., we talked about how often marketing is looked to as the “leads people.” We need to think beyond that, regarding how they can impact efficiency and effectiveness of each individual sales rep.
How do you think marketing can help raise the level of performance of sales? 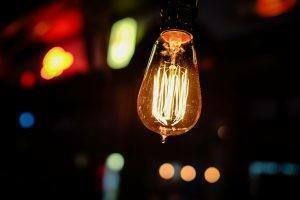 I believe that we must change our mindset from marketing being the “awareness people,” the “create interest people,” the “leads people,” the “demand gen people,” and so on and so forth, and look at the entire customer buying journey. Look at what that is and who can contribute to that. We have the traditional feeling that marketing does demand gen, and lead gen, and tosses those over the wall to sales. And sales immediately reject all of them as being bad and tosses them back. But we separate these processes. I think modern sales and modern marketing is very different. I like to look at modern marketing and sales as kind of like a basketball team. On a basketball team, every person has their defined roles. You have a couple of guards, you have a couple of forwards, you have a center, and you practice plays, and everybody tries and plays those roles. You get really expert at that. But then in the game, you’re very agile and nimble and adapt to what’s happening with competition and what’s going on with the game. I think we need to look at marketing and sales more like a basketball team. What are our roles? What are our responsibilities? What are the plays that we execute? Who executes those? I look at marketing and sales, not as the sequential process where marketing gets the leads and gives them to sales, and sales takes care of everything throughout, but we work together in the demand gen process, and we cooperate in the buying process. There’s a huge amount that marketing can bring to the party with qualified opportunities. Whether it’s case studies, whether it’s tools, whether it’s content relevant to where the person is towards the end of the buying journey, and those kinds of things. We really need to look at it as an interrelated, and integrated set of processes. Brian: It makes a lot of sense, what you’re talking about. I think the challenge is that marketing and sales often are doing the same things. They might have different words for it. For example, marketing may call it lead gen, lead generation, or inbound sales might call it prospecting, social selling, etc. They’re doing the same things. As I’ve talked to salespeople, they often are feeling they’re succeeding despite marketing, not because of it. I was talking to someone trying to build his own pipeline. He was getting leads from marketing, they weren’t helping. He was prospecting, trying to figure out how to cold-call, etc. Do you think salespeople are getting it wrong with how they prospect? I do think we’re getting a lot wrong about prospecting. One is I don’t think enough salespeople are prospecting. I think the first thing we do is we must change salespeople’s mentality and say, you know, marketing is going to do everything they can to get you the right kind of leads, and the right kinds of opportunities. SDR’s are going to do everything they can. But if the volume isn’t sufficient, you have to go out and start finding business yourself. You have to prospect. You have to generate new business. You might go to marketing and ask them for help in doing that, maybe giving you a particular program that you can execute as well. The other thing too is I sometimes think we get our prospecting models, and particularly the SDR-driven type models a little bit backward. I think we do a disservice to SDRs. Most organizations, the SDR is kind of an entry-level job to selling. They do something that most salespeople would refuse to do, which is to call people they’ve never spoken to before and prospect them. It’s a really tough job. But one of the disconnects we have is these poor SDRs often calling on C-level people. I get SDRs calling me every day. I feel really sorry for them because they’ll call me and say, “We believe we can help you improve your business.” And I say, “Cool. What am I doing wrong? How should I be developing my business?” and they’re floored. They don’t know how to carry on that conversation. They shouldn’t be expected to. If they’re brand new to selling, why are they calling me, a C-level executive, albeit of a small company, but a C-level executive? We’re matching the wrong people up with the target audience. As a result, we’re creating terrible first impressions. If somebody calls me and they can’t have a powerful, engaging first conversation, I’m going to have a negative opinion both of that individual and of their company. I think we’re missing huge amounts of opportunities by not having the right people. I wrote an article about a year ago saying, “Maybe we need to get some of our most talented senior-level salespeople being SDRs.” If they’re creating that first impression, and if our target persona is this C-level person, then those are the people that have the best capability of setting up a very, very positive first impression, and opening up far more opportunities than a brand new SDR without that experience base. Brian: I love that suggestion. It reminds me before it was called an SDR, that’s what I started as at 23. I was on the phone. I was calling C-level people, 23 years old. There was very little training advice, coaching. It was on the job. Later, I started a company helping people do that. I worked for a company that, myself, I was CEO. I made calls with the team who was on the phone, and the whole point was to learn, to see what they were experiencing, to understand. This is really a great transition into talking about this idea of empathy. That’s the hard part: how can somebody who doesn’t have experience connect with someone else and understand their perspective and feeling? How can sellers be more empathy-based with their approach to customers? Dave: I think there are some things. First of all, empathy is about caring. You’ve got to care about your customers, whoever those customers are. If you’re only in business to say, “How can I get an order?” then you’re never going to be successful at all. You’ve got to care about your customers. You’ve got to care about their success in achieving their goals. If you’re driven by that, it changes your whole orientation and your process for engaging the customer in the conversations you have. That shouldn’t be a do-good or Pollyanna-ish kind of mentality. The only people I’m going to engage are people who I know have the problems that I can solve. I’m not wasting my time calling on people, and engaging them, and caring about them and their success if they don’t have the problems that I can help them solve. It is very focused on calling the right people that we can do some things with. And then it’s understanding who they are. It’s kind of sitting behind their desk or being able to walk in their shoes. There are a whole number of ways you can do that. I used to sell to the large money center banks in New York City. To learn about banking, you hang out where the bankers hang out, and they hung out at Harry’s at Hanover Square. I’d learn a lot by just talking to them over a beer about what their businesses were, what their dreams were, where their problems were, which enabled me to connect much more effectively with those people in the business. We’ve got to start hanging out where our customers hang out, whether it’s discussion groups, whether it’s trade shows. It’s really learning about where they live, and what they worry about every day. It’s asking questions, it’s getting engaged in those conversations. I think along with caring, is curiosity. If you have those two attributes, you’re going to figure out what the customer’s about. You’re going to know how to engage the customers. You’re going to understand how your products and solutions might serve the client and help them. Two fundamental attributes: caring and curiosity. Brian: That is terrific. I really liked how you brought it together, regarding meeting those elements, then immersing yourself in the world of your customer, going where they are. was listening to you, I don’t know that the marketers who are reaching out, or making that initial impression, have actually been able to get in the world of the people they’re hoping to influence and help to drive change, to work with them through their journey. I would say that what you shared, what you did, as a salesperson, we need to do that in marketing too: get in the world of the customer and observe. From that, we’re going to have the empathy, or to put it another way, we’ll have the intuition. Our empathy is our marketing and sales intuition; to know how to best move forward in what some of those opportunities are. Dave: It’s really funny how some of these cycles go, but I remember maybe 10, 15 years ago, when there were a lot of initiatives around understanding the voice of the customer. When you looked at the way a lot of those initiatives were implemented, some of them literally would live for several weeks with the customers and sit and observe them in their jobs, etc. What other actionable advice do you have for those who want to help improve sales enablement? Dave: I think it’s a little bit counterintuitive. It may sound simplistic, but we don’t do it. So many of our initiatives, so much of our thinking is driven inward-out, rather than outward-in. We have our products, and we have our services. We think about what we want to do, and how we want to bring those to market, and so we develop all our launch programs, all our marketing programs, all our sales programs, from an internally-based orientation, about what’s most effective and what’s most efficient for us. Usually, when we execute those, we find we’ve missed one thing: we’ve forgotten about the customer. What we do that may be most effective and efficient for us, but may not be effective or efficient for the customer. So generally, I find the fastest way to the best and most effective solution is always to work your way back in from the customer. How do they learn about things? Trace those things back into the design the process that meets them where they’re at, rather than trying to force them to find us and meet us where we’re at. The post Getting sales enablement right to increase results appeared first on the B2B Lead Blog.